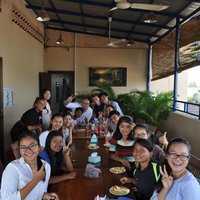 The Australian Centre for Education (ACE) was established in 1992 and is a leader in the provision of English Language training and testing services in Cambodia, and in the South East Asia region. ACE is an initiative of IDP Education, one of the world’s largest student services providers and an owner of the IELTS test. We are currently (2018) the only recognized Cambridge English CELTA teacher training center in Cambodia. We have local connections to help CELTA graduates find jobs in Cambodia. We also recruit from the CELTA and successful candidates, who meet our qualification requirements, are invited to interview for jobs in our school in Siem Reap and Phnom Penh. (Recruitment is based on the schools needs at the time of application). We also have a partnership with ACET, who have schools in Hanoi and Ho Chi Minh City, Vietnam. They offer our successful candidates a 50% discount on the cost of the CELTA if they sign a 12-month contract within a month of completing the course. The offer depends on Job availability and a successful job interview. The money will be refunded in two halves – after the 6th payment of the year, and at the end of the 12-month contract. To assist with your stay, ACE has partnerships with a range of different hotels, hostels, and guesthouses. Please feel free to contact the center for help with accommodation. • Work as an assistant for one week with highly qualified and experienced teachers. • Observe skilled teachers put CELTA techniques into practice in the classroom. • The chance to work with an ACE mentor who will guide you through our academic procedures, and best classroom practices. • An opportunity to co-teach with your mentor and develop your confidence and your teaching skills. All course fees/deposits are non-refundable. Should candidates find themselves unable to continue the course, they may transfer to a future course, but this is always at the discretion of ACE Cambodia and depending on available places, and this must also be within six months following the end of the original course. If your course is cancelled, we will either fully refund all deposits/payments or arrange for you to sign up for the next suitable course. You must also be fully aware that there is a chance that trainees can fail the course, and if this happens, all deposits/payments are non-refundable. We offer the CELTA course in both Siem Reap and Phnom Penh, which are two of the biggest cities in Cambodia. Siem Reap is now one of the most popular tourism destinations in the world. It provides easy access to Angkor Wat, regarded as the eighth wonder of the world, and many other breath-taking temples, exceptional museums, traditional villages, and natural spaces. Siem Reap is known as the epicenter of Cambodia and has more hotels than Angkorian temples, first-class wining and dining and luxurious spas in which to relax after a long day. Phnom Penh is the dynamic and bustling capital city of Cambodia. It has some of the best historical and touristic sites in the country as well as a big city vibe in a small space. The city provides plenty of activities and insights into Khmer culture, which also makes it one of the most desirable destinations in South East Asia. In order to provide you with the best service possible, Australian Centre for Education needs to know a little about your specific situation. If you have questions, please first select a course from the list on the this page. You can always change course dates later. I thought Phil and the team at the SR campus were all very helpful. The information and experience of the course has helped me tremendously in my career. It was very demanding but the teaching and experience was very helpful to me in the work that I am doing. I am thankful for the experience. CELTA was tough but everyone from the tutors to the staff were extremely helpful. An intensive, but hugely rewarding experience - great to be immersed in teaching at the outset, rather than endless theory. The approachability and professionalism of the tutors was fantastic - no hesitation in recommending this course to anyone who is keen to become an EFL teacher.